If you are one of the anglers who prefer to visit their local water body for a fishing expedition, you need to invest in a good backpack. However, fishing backpacks are slightly different from any other kind of bags out there. Most importantly, the bag should always be comfortable to carry and spacious to accommodate your fishing gear. Our goal is to link you up with the best backpack and that's why we compiled the following run-down for you. Whether looking for a typical backpack or a convenient sling bag, the following table has it all. That's pretty much all it takes to enjoy your outdoor trips be they fishing, cycling or hiking ones. 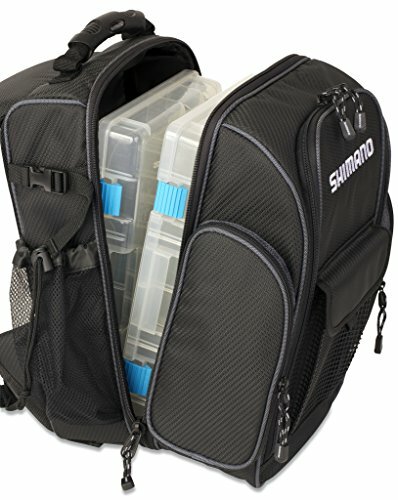 The Shimano-Blackmoon is a fishing backpack designed for carrying fishing gear and tackle boxes. It is constructed from heavy-duty textured fabric. The shoulder straps are thickly padded to reduce fatigue. It has a zippered front and the side pockets have zips too. It is designed with ample storage space. 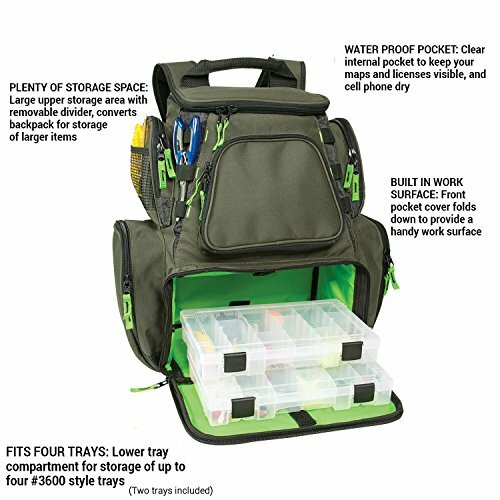 The front loading is designed for tackle boxes, then there is additional room in the zippered pockets and side pockets. Also, both sides of the backpack have built-in mesh rod holders. There are two designs to choose from, compact and medium size. A purchase includes tackle boxes and a rain cover. Custom Leathercraft WildRiver is a uniquely designed fishing bag suitable for day or night fishing adventures. It has an integrated LED light for lighting at night. The backpack comes with enough storage space. The lower compartment can accommodate up to four 3600 utility trays. It has a waterproof internal pocket for carrying personal items. In addition, it has a sunglass holder and a removable holder for pliers. For your convenience, the front pocket cover can be converted into a work surface by folding it down. Carrying the backpack is easy and comfortable, thanks to the padded shoulder pads. Further, it has a rain cover to keep the contents of your bag safe in case it gets wet. Piscifun Backpack is designed for carrying an angler’s tools and equipment for a day or weekend fishing trip. It is a perfect tackle bag for both seasoned and newbie anglers. The backpack is made from Super 420D PVC Canvas Material, which is lightweight for easy carrying of the bag and also tough for durability. It is designed with an ergonomic single strap, which has adjustable buckles for easy carrying of the bag. The bag has many storage compartments for organizing all your items well. It also has a pocket for keeping your personal items. The bag is very affordable and is backed by the manufacturer’s one year warranty. 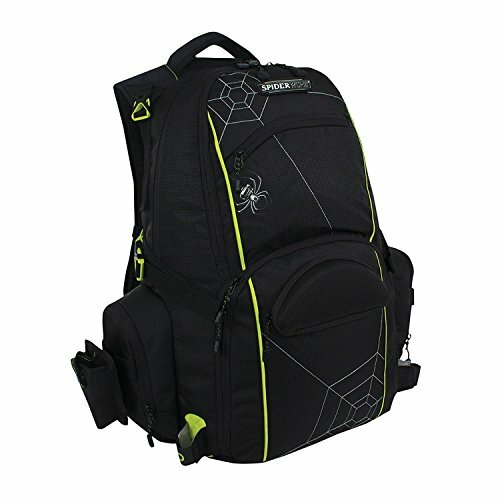 Spiderwire Fishing Backpack is a medium-priced bag that comes with features to suit your outdoor packing needs. The bag is designed with three main storage spaces. The top compartment is ideal for keeping your personal items. 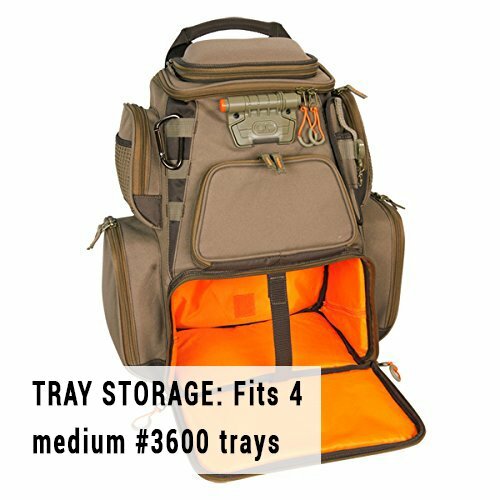 The middle compartment is cooler and will keep drinks, food, and baits cool while the lower compartment is designed for carrying your utility boxes. It has left and right side zippered pockets. In addition, it has a sunglasses case with soft lining and foam molded. Removable fishing tool holders are attached to either side of the backpack. It also has a place for carrying your fishing rods. The bag has a flat bottom for keeping the bag sitting upright. Besides that, the shoulder straps are designed thick and therefore comfortable. It also has waist and chest straps for even weight distribution. Wild River WT3606 is a mid-priced bag that is designed with ample storage space to fit a day or weekend fishing expedition. The large upper storage area has a removable divider to convert the space into a larger area for storing larger items. The bag fits four 3600 utility trays. It has a waterproof pocket to protect your personal items like maps, licenses, mobile phone. The front pocket can be converted into a worksurface by folding it down. 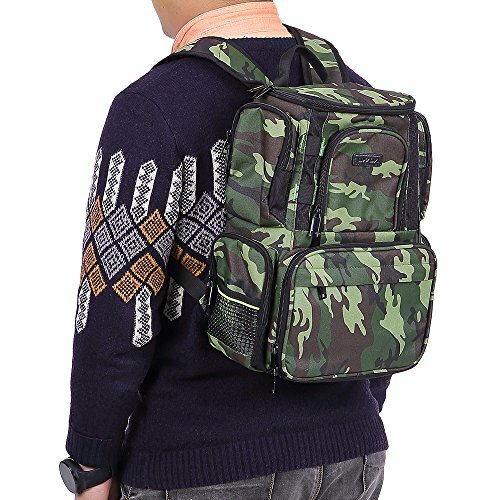 It is an easy-to-carry backpack with large and padded shoulder straps that are adjustable. It also has an extra strap. The package comes with the option of buying with or without trays. Anglerbasics Outdoor Bag is an inexpensive and quite functional multipurpose bag that can be used for fishing, sports, hiking, travel and other outdoor activities. The bag is made from high-quality wear resistant canvas for durability and also for lightweight. The bag is weather-resistant. 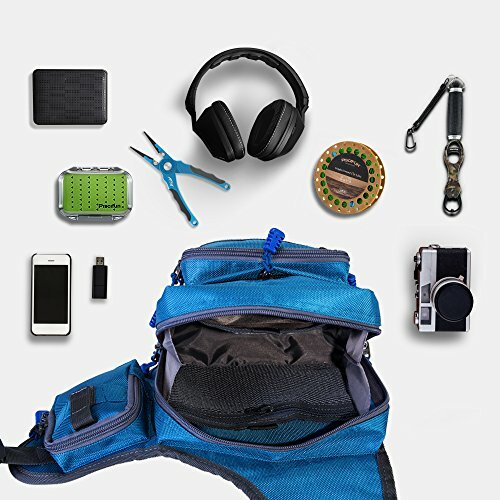 The backpack has ample storage space including a compartment for personal items like MP3, makeup, cell phones, fishing license. It also has an outside mesh compartment. It is fitted with durable zippers and it has a strap and securing lock. Lixada Backpack is a perfect bag for a day trip fishing adventure or other outdoor activities. The bag is medium priced and therefore a little bit expensive. It is designed with enough storage. It has a large storage area that can be extended further by removing the divider if you need to carry large items. In addition, it has four zippered pockets and two mesh pouches. The interior has a zippered water-resistant pocket for keeping all your electronics and documents. The shoulder straps are padded and adjustable for a comfortable fit. Besides, the bag has a rugged an anti-scratch bottom to protect the bag from hard surfaces like rocks. Fiblink Backpack is a bag designed beautifully with interesting colors including camouflage. It is a multipurpose outdoor bag suitable for fishing, sports, cycling, hiking, camping or a messenger sling bag. The bag is made from high quality heavy-duty 1000D Nylon fabric. It is wear-resistant and has a waterproof coating. The bag has various storage compartments. It has large and small pockets. Features include a zippered padded main compartment, a number of vented and zippered pockets and a personal items holder. Three little pockets are included for your convenience, a bottle bag, toolkit, and pole bag. It -is has KAM buckles which are pressure resistance and durable. It comes with an ergonomic shoulder strap for your comfort. 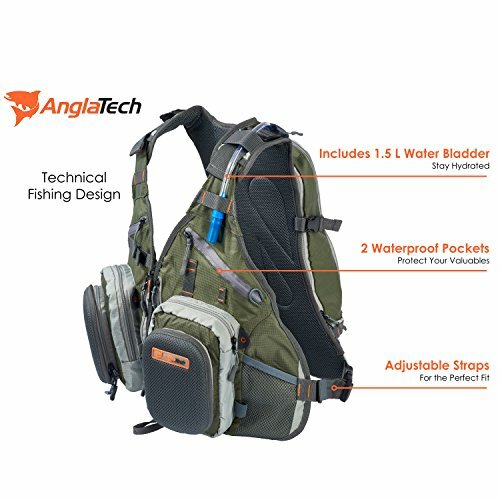 Anglatech Backpack comes with many features to make you enjoy every fishing adventure. It is a moderately-priced backpack. It is designed with enough storage to fit your fishing gear and equipment and keep it well organized. It has two waterproof pockets. It has a number of zippered compartments and enough storage with a compartment for expandable storage. It has straps for your fishing rods. The zippers are fitted with cord pulls for easy opening and closing. The front has a vest and other small pouches and slips. The back has three zippered compartments, D-rings, slip pockets for storage. The bag has a breathable mesh back to allow the free flow of air, keeping you cool and dry. The shoulder and waist straps are adjustable to fit persons of different sizes. A purchase comes with a 1.5-liter water bladder. 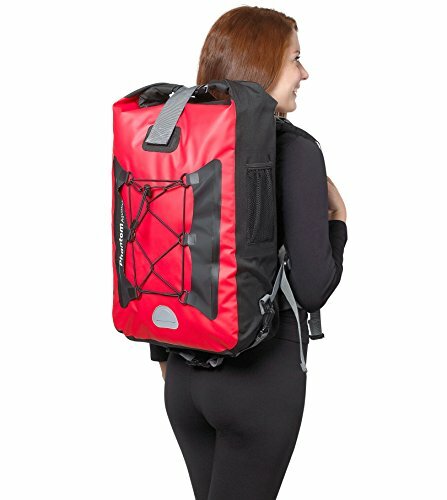 Phantom Aquatics Backpack is 100% waterproof backpack designed to float in water. It is a mid-priced bag perfect for watersports and to use when the weather is wet. It is crafted with a high frequency welded construction with a two-way sealing system. The bag keeps dust, dirt, water, and sand from reaching the contents in the bag. The bag has one main internal zip pocket. The back panel is designed to allow air flow and keep you cool. It has an elasticated front webbing and super reflective patches on the shoulder straps and front of the bag. It comes with padded shoulder straps and back support. From the reviews above, it's possible to tell that there are so many stylish options available at one's disposal. So, how do you go about finding out which one of them represents the best value for money? Well, our editors summed up the following as the most critical factors to ponder on. The truth of the matter is that different types of backpacks exist. So, you only need to pick one that fits your style, body type, and luggage type. Basically, if you're planning to carry small loads, chest packs and waist packs would be your best bets. At the same time, if you're the type of angler who carries plenty of gear e.g. lures, hooks and so forth, you're better of finding a big bag. 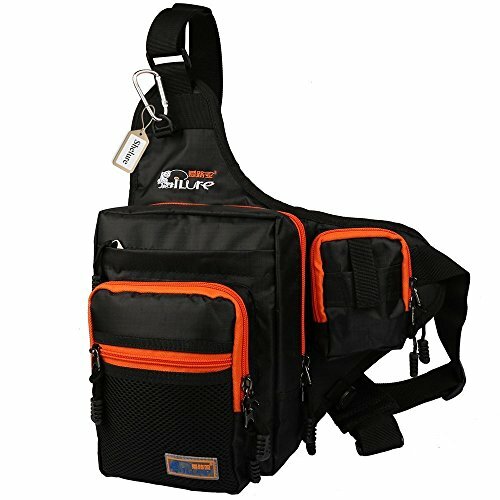 Thinking of investing in slingback backpacks for fishing? Well, what you need to know is that these ones are best suited for short fishing trips. They usually aren't too large. But even with that said, they're best known for sitting pretty comfortably against your body. In addition, their peculiar design makes it a tad easier to access your fishing gear even when paddling a kayak. The best kind of fishing bag is one that provides enough space to store your supplies, equipment, gear, and snacks. And if you're one of the people who hunt for fish all day long, you might want to have a bag that can accommodate a change of clothes. Besides the storage capacity provided, you also want to focus on the design of the storage compartments. For instance, a bag with lots of tackle boxes can be awesome for fly fishing. Likewise, a backpack with zippered and mesh pockets would come in handy in storing the accessories you need to access quickly. There also some fishing bags which come with dedicated rod holders. Such holders come in handy in freeing up your hand so you can focus on using your two hands when necessary. Always let your style of fishing and future plans dictate the kind of backpack you settle for. If you're a deep-water angler who rides on a boat, then it'd make sense to go for a big bag. That's because the extra weight can always be carried by boat. On the other hand, if you're a fly fisher, you need to remember that you may need to wade in the water for long hours. So, if your backpack is too heavy or uncomfortable, that might prove a major issue. At the same time, though, you want to make sure your backpack is reasonably sized and that it has the capacity to store quite a few items for you. How Durable Is Your Bag? Prolonged hours of use and exposure to extreme weather patterns can cause your bag to wear out, prematurely. So, just to make sure your bag is capable of lasting long, you want to pay attention to durability. So, how can one tell whether a bag is durable or not by just looking at it? Well, it's pretty simple. For starters, you want to check if it's made from a resilient material. Some resilient materials include polyester, heavy-duty nylon, canvas, and polyester. The material should basically be rugged enough to withstand the harsh outdoor environment and the weight of your gear. Besides that, always pay close attention to the manner in which the backpack is constructed. You basically want to take note of how the seams have been made. If you can get a bag with double seam stitching, you'd be more assured that it can handle heavy loads, for long. So, if possible, avoid bags with single seam stitching. If you're after a near-perfect backpack, we'd suggest going for the Shimano-Blackmoon Fishing Backpack Bag. It's tough and generally well-made. 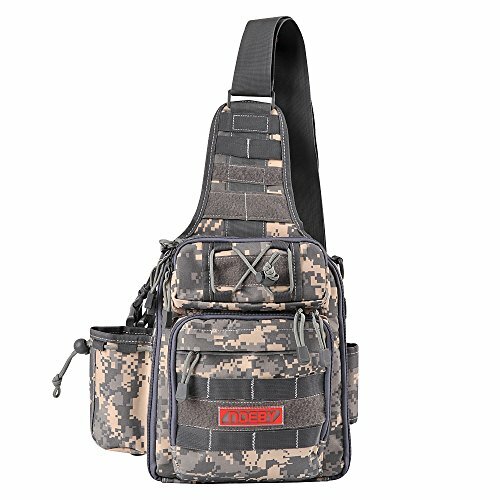 However, if you're looking for a simple bag to start with, we'd recommend the Piscifun Backpack Fishing Tackle Crossbody Messenger Sling Bag. It's good-looking, light in weight and ideal for anyone looking for extra convenience. So, as you might have noticed, the clarion call of this article is all about knowing your preferences. The more you understand your fishing style, the better you will become at picking the ideal backpack.